You are here: Home / Fence School / What regulations can impact my fence project? Today most fence ordinances can be found online. You just need to know in which City, Township or Village your property is located. Today most fence ordinances can be found online. You just need to know in which. City, Township or Village your property is located. It’s a little more challenging to find the fence regulations for Waunakee (www.waunakee.com) or other townships, villages and cities in this area. But don’t give up until you find out for sure. Most often your municipality requires that you take out a building permit–a must do task if that’s the case. These governmental regulations typically spell out things like whether a fence is allowed on the property line, or how many inches or feet you need to stay within the property line. Some have height restrictions, and some even tell you what kind of fence is allowed. These regulations can be difficult to understand so we will be happy to help you with that. Private ordinances are different. Typically, they are established and enforced by a homeowners association or developer. You will need to find out from them what is, or is not, permitted in your neighborhood. 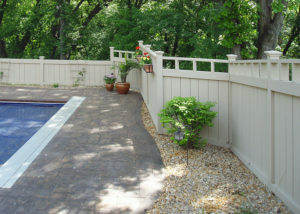 Believe me, you want to make sure your fence will be allowed and is in the right place the first time!